In the median of Alexandria Pike, next to DEP's Fine Wine & Spirits in Fort Thomas, is a little decorated Christmas tree. For most of December folks have driven past the tree, driving to and from work, chauffeuring children and tackling seemingly never-ending holiday to-do lists. And that little tree, all red and gold in a landscape of grays and browns, brought a smile to travelers preparing to merge onto I-471, who, while driving past, were likely stuck in the hum-drum of life rather than in the midst of holiday cheer. And for that we have (Charley) Chuck Hazel, a retired Chief of Police with the Southgate Police Department, to thank. "Cathy, my wife, and I drive by there a lot and she said that it was a cute little bush," Hazel says. (And yes, the little tree is actually a bush that has been growing in the median for some time now.) "We both said, 'Wouldn't it be great if it was decorated?' Being in the Christmas spirit I went to the store and picked up some little decorations." Hazel decorated it, and with that small act of kindness, he gifted countless doses of holiday cheer during what is often a difficult month for many. 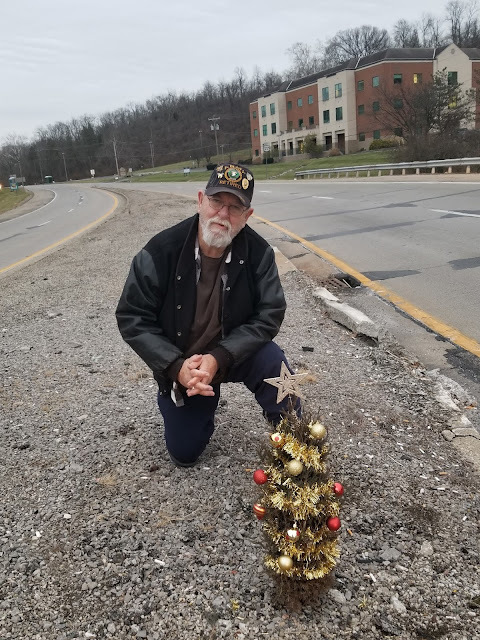 "I drove by the undecorated little tree every day thinking how out of place it looked," says Fort Thomas resident and one of the founders of NKY Hates Heroin Holly Specht. 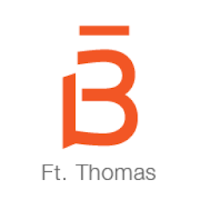 "I feel that way a lot during the holidays since the loss of our son Nicholas. One day I decided I should decorate that little lonely tree. Funny, someone else had the same idea. One morning, on my usual drive to work there it was – decorated from top to bottom. This little, tiny, lonely tree now looked festive and ready to shine. It truly made me smile and actually laugh out loud that morning. Things didn't look so sad to me that morning. I realized that someone I never met had changed my spirit by this sweet gesture by simply bringing notice to this lonely little tree." That someone, Hazel, is also retired from the United States Army, past Commander of John R. Little VFW Post Southgate, and a member of the Masons Fort Thomas and the Shriners. Hazel says back in the 1990s, Fort Thomas Chief of Police Mike Daly worked for him as a rookie. Hazel also is an ordained minister and, in July, married Melissa and Christopher Beckett in front of the Mess Hall in Fort Thomas. "When I see that little tree, it gives me a glimmer of hope that things will be better in 2018," says Melissa Beckett, a Fort Thomas resident and City Clerk. "My 2017 and prior have not been easy, nor has Charley's and his family. I pray for them often and am blessed to have them as friends. I think we all need a little pick me up now and again, and that little tree does just that. It makes me smile." 18 N. Fort Thomas Ave.
Hazel says he's not sure who the tree (bush) belongs to, whether it's Fort Thomas, Southgate or the county. "But if it is there next year I plan to decorate it again," he says. Hazel has heard from folks all over the county, letting him now how much they appreciate the tree. "It not only brings a smile to my wife and I, but it appears to make others smile as well," Hazel says. "It's the Christmas spirit, I guess." This story originally ran on January 3, 2018. Thanks for a bit of joy on a gray day.